The Super Conductor wire is a high performance wire from the inside out. Spark plug wires have two main objectives; transfer the spark energy and suppress the Electro Magnetic Interference (EMI) that the spark voltage creates. The MSD 8.5mm Super Conductor delivers the best of both worlds! MSD uses a special copper conductor keeping resistance under 50 ohms per foot! Even with this low resistance, the wire retains high EMI suppression capabilities. By wrapping the conductor tightly around a ferro-magnetic impregnated center core an EMI choke is created keeping any interference inside the wire. The outer sleeve is a combination of silicone and synthetic materials for supreme resistance against heat, chemicals and abrasion. Thick boots with more material also help guard against spark arcing to ground and special dual crimp terminals grip the conductor and the sleeve of the wire so there is no chance of the terminal pulling off the wire. The 8.5mm Wire is available in bulk and universal sets. 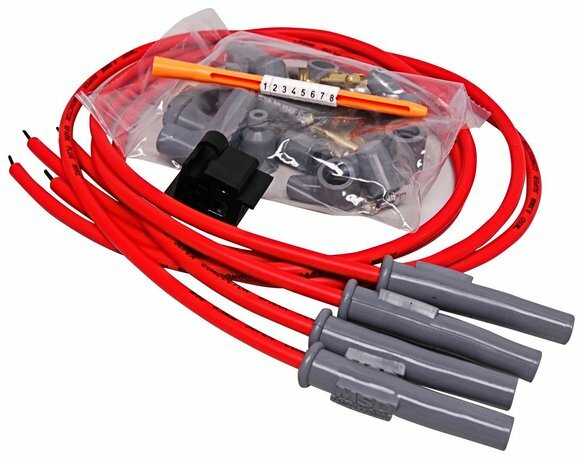 Universal kits are supplied with the spark plug terminal and boot installed, then you cut the wire to length and crimp the coil side on. MSD even supplies a Mini-Stripperr_Crimper tool to produce a firm crimp.